As I have mentioned previously in several articles it is often difficult to decide on what to write about and, often as not, some birding event occurs that conveniently provides me with a topic for the week. So it happened for this article. My wife and I had gone to Saskatoon one day and upon our return in the late afternoon of the following day I glanced out the window to check on the bird life in our backyard when I noticed a rather large bird sitting on the rail of our arbour partially obscured by a feeder. One look through binoculars and we quickly realized that it was an owl, but what kind? I frantically took a series of pictures which turned out quite sharp considering the time of day and the heavily overcast skies. I got out several field guides and compared the pictures in the book to the ones in my camera but, even so confusion reigned. We could not decide whether it was a Short Eared Owl or a Hawk Owl. However, by examining all physical, migratory and habitat details we determined that it was neither one of the two, rather, it was a Boreal Owl which was a lifer for the two of us. The ten inch long Boreal Owl is our second smallest owl next in size to our smallest owl, the eight inch long Saw Whet Owl. (See article No. 132). In terms of field marks the Boreal is a larger and greyer version of its smaller and browner cousin the Saw Whet. Both are very tame and can be approached closely before taking flight. The one big difference is that the Saw Whet is migratory and flies south for the winter whereas the Boreal is a year round resident of the Boreal Forest occasionally irrupting a little south during severe winters as this one had done. The much larger and better known Snowy Owl does much the same. 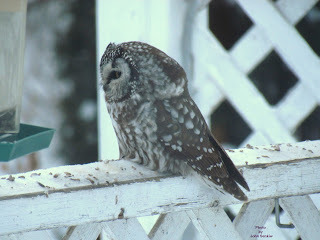 One of the reasons we had so much trouble identifying this owl is that it appeared to be too large for a Boreal. Sitting on the rail it looked crow-sized which is way oversized for a Boreal Owl but, after studying it for awhile and comparing its size to that of a nearby feeder we realized that it was not so big after all. Its short tail, very large head and fluffy body distorted its size giving it the impression of a much larger bird. 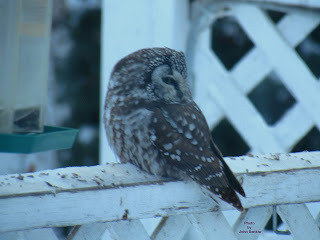 After I had taken a sufficient number of pictures my wife went out to fill the feeders at which point we expected the owl to fly away as soon as the door opened but the owl stayed put until my wife was about five feet away. What was somewhat comical is that my wife was talking to the owl as she approached it and the owl seemed to be listening. What was even more unusual is that a short time later, after the sun had set, my wife and I were having a hot tea in our solarium when the owl flew up near the window, landed on a snow covered cedar and proceeded to observe us with apparent interest. It did not sit for very long but long enough for us to get a good view of it from a different angle. This time the owl looked much smaller than it did before thus confirming our identification of it as a Boreal Owl. With the lights on inside and the darkness outside getting a picture of it was impossible. black and white it can be identified with the help of a bird book. Earlier today as we were having our late morning coffee and watching the House Sparrows and Common Redpolls (hereinafter referred to as simply Redpolls) feeding frantically at the oilseed and Canola feeders respectively the birds suddenly scattered in a panic. At that moment a Northern Shrike landed in a Pincherry tree near the feeders and proceeded to survey the area. I rushed for my camera but this shrike was impatient and flew off before I could get a shot of him. The following morning when it was still quite dark he came again but flew off empty handed again. Bird feeding stations are a very convenient place for predators like shrikes to find lunch. It was a good half day before the birds returned. On a more positive note the Pine Grosbeaks have returned after an absence of several days. I do not know if they are the same birds that were here before as there are more females in this flock. As a result I did manage to get some good pictures of the females. The number of Redpolls at our feeders has gone from a half dozen or so to four or five times as many birds. To accommodate that many birds we have put out another Canola feeder. I am still surprised at their preference for Canola seed when all the other birds completely avoid it. If nothing else they are cheap to feed. 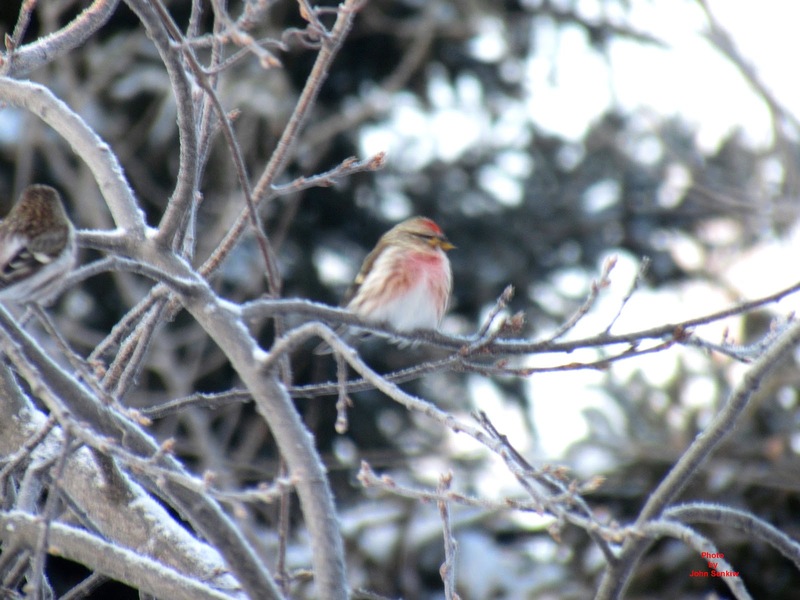 Like Pine Grosbeaks, Redpolls are circumpolar in distribution nesting in the evergreen scrub in the Tundra and flying south of the Boreal Forest for the winter. Like all finches the males and females are different although the differences in Redpolls are not as obvious as in other finches. Both sexes are small brown striped birds with yellow bills and red forehead patches. The males also have a rosy wash at the top and along the sides of the breast. From a frontal view both birds have a full length broad white stripe that can be compared to a man wearing an unbuttoned suit exposing a white shirt. There is another species of Redpoll, the Hoary Redpoll, that occasionally shows up here mixed in with a flock of Common Redpolls. The Hoary is a very white version of the Common with very little striping on the breast and belly nor does the male have any rose on the breast only a slight tinge of pink. The Hoary spends the entire year on the Tundra except for the odd stray that shows up here. 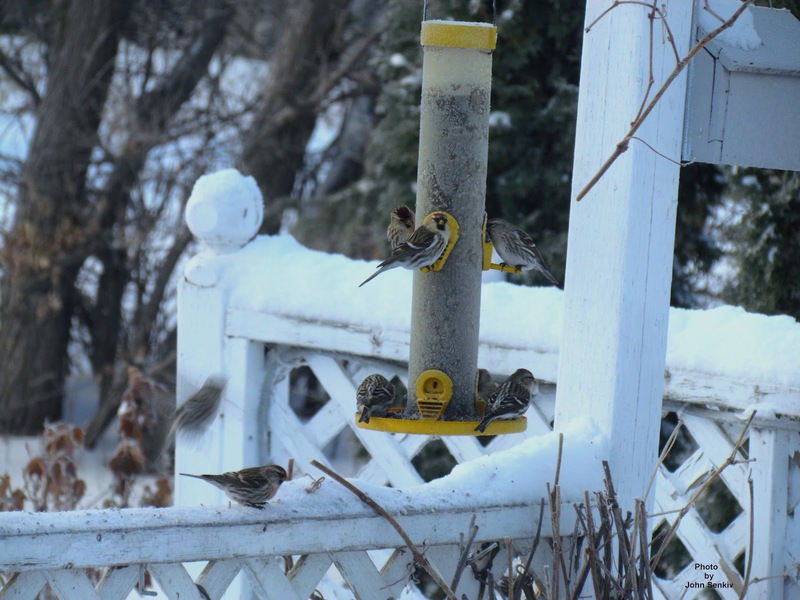 Fortunately, there has been one at our feeders this year. Now if only I can get a picture of it. The two species are closely related and taxonomists have lumped them together as one species in the past only to separate them later on. Presently they are considered two species. 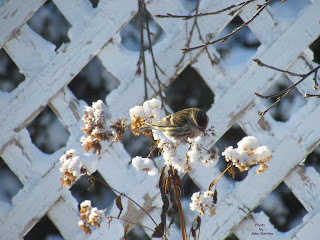 This week I have included three pictures of Redpolls. One is of a lone bird, a mature male, in a tree showing the dark red forehead patch, yellow bill and pink on the breast: the second photo is of a flock of Redpolls (no mature males) at our Canola feeder: the third is of a lone female feeding on seeds of a plant in our garden.